Ticks are vectors of diseases and they often pick on your pets. Because of this, you are most likely on the lookout for effective tick repellent for dogs. If you own cats instead, naturally it is tick repellent for cats, one that would really work, that you would want to use. You give your pooch or your feline your time, love and devotion, not to mention the extra expenses on their food and other needs. Naturally you don’t want them suffering from any of the dreaded infections that could make their life miserable only because of pests so small. But the size of ticks should not be taken for granted. Tiny as they are, they can be deadly. For puppies and kittens, ticks may be a reason too for significant loss of blood. It’s a situation that could endanger the lives of young animals. Other than the care and attention that you shower on your beloved pets, finding the most effective way of preventing them from getting any disease will help your animals stay in the pink of health. You can buy the most expensive tick repellent for dogs or for cats but to make sure that your effort and money do not go to waste, cover everything. This means thorough tick control measures to guarantee that your pets stay out of harm’s way where ticks are concerned. Your yard, pet areas and other “tick-friendly” spots at home should be cleaned and treated on a regular basis. Fenvalerate-based products typically serve this purpose very well. Treatment should be done every week or two especially during tick season. Warmer months are known to be tick-season but some types of tick are at their pick too during the frosty winter months. That said, you may need to do treatments not only during summer but also during winter because the cold temperature does not kill the said creatures. Reduce the number of ticks at home with cleaning and treatments but the use of tick repellent for cats and dogs will still be needed especially if your pets venture into the woods, grasslands, hiking trails and other places where ticks are likely to be found. These products appear to be the most convenient to use as you only need a small amount to apply on your dog’s or cat’s back and the effect is longer compared to other repellents. Check with your vet or local pet shop about which topical is good to use on your pet just to be sure. 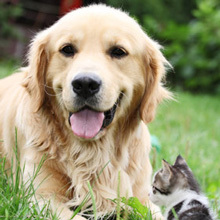 Some chemical ingredients can cause reactions on cats but would work well on dogs. Most formulas contain pyrethrin that works to help get rid of not only ticks but fleas that are already attached on the pets. Make sure to carefully follow instructions to avoid doing your pet any harm particularly the eyes and ears. Also, some products are known to have lingering effects. Sprays are also effective anti-tick products but not all are meant to work as tick repellent for cats. Sprays that contain permethrin work very well for dogs to ward off ticks but this chemical could be deadly on cats. For your felines, look for anti-tick spray products with pyrethrin instead. Powder products are the easiest to apply on both dogs or cats but could be a bit messy. They are best applied in open areas of the house to avoid dusting surfaces with the powder. Check with your vet about the use of powders if you suspect your pet to suffer from any allergies or chronic airways conditions like asthma. As tick repellent for dogs, collars are probably the most popular and the most preferred by many owners due to its convenience of use. Collars work well on cats too if they are used to having one around their neck. Just be sure to get the right size for your pet so that no extra length is within easy reach of your pet’s mouth to chew on. You might also want to find out if the product is suited to be worn anytime or if water affects its effectiveness in case your dog swims. Irritation may also develop if worn too long so make sure to often check the neck area should you opt to use collars for your cats or dogs as tick prevention. While these products also do a good job as tick repellent for cats and dogs, they are probably the least preferred. The chance of contaminating the eyes and the ears of your pet is high if you are not careful during application. Also, you need to be in well-ventilated areas when using such products on your pets. Permethrin, pyrethrin and organophosphates are the commonly used ingredients in dips and rinses so make sure to read the contents because cats cannot tolerate permethrin. These products, while proven to be useful and effective in keeping ticks away so that your pets don’t suffer any tick-borne diseases, they can only do so much of the job. You may have found the best tick repellent for dogs or for cats perhaps, the job does not begin and end there. Nothing beats being on your guard at all times when it comes to these creatures who are masters of sneaky means to infest your home or your pets. It is never a waste of time to regularly check your pets, your home or your yard because even a single tick can become a hundred to a thousand. Other than the use of tick repellent for cats or tick-control products for your dog, see your local veterinarian for a possible vaccination against diseases transmitted by ticks. Your pet is sure to reward you with extra love and loyalty for giving them additional protection.